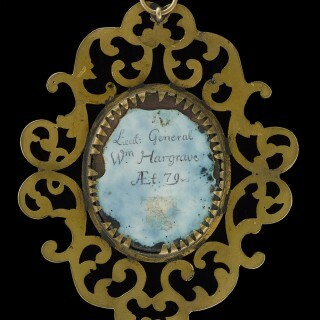 William Hargrave was one such man. Over the course of a military career that had spanned some forty years, Hargrave had served in the Low Countries, in Spain during the Wars of the Spanish Succession, and had taken part in the failed Jacobite uprising at the Battle of Sheriffmuir in 1715. Clearly his military skills were so valuable to the crown that this at of gross disloyalty was overlooked and his stock continued to rise. Indeed, shortly before he was appointed to the position of governor, he had been made a Colonel of the Royal Fusiliers. As governor, Hargrave presided over something of a cowboy state, whose citizens lived in an active fort that they were expected to desert at a moment’s notice for the pursuit of military operations and in which many fundamental rights had yet to be granted. The administration survived by exacting levies on passing ships – which often amounted to bribes – and the governor could at times be arbitrary in the implementation of his will. 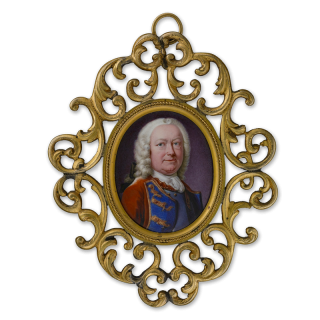 Nevertheless, Hargrave enjoyed a quiet retirement of two years, dying in 1751, the year in which the present miniature was painted. As in the case of this miniature, when he desired his likeness to be recorded Hargrave insisted on the highest standards of craftsmanship. In spite or because of his personally capricious attitude towards rights of law and property, Hargrave was honoured in Westminster Abbey by a spectacular funerary monument designed and executed by the pre-eminent sculptor of the age, Louis François Roubiliac.